DescriptionAfter the Nazi invasion of Hungary on March 19, 1944, 825,000 Hungarian Jews came under attack. Swiss Vice-Consul Carl Lutz issued thousands of safe passes and provided asylum to Jews threatened with deportation inside the Glass House, the site of a former glass factory. Lutz became the first Swiss national honoured as “Righteous Among the Nations” for the rescue of 62,000 Jews. 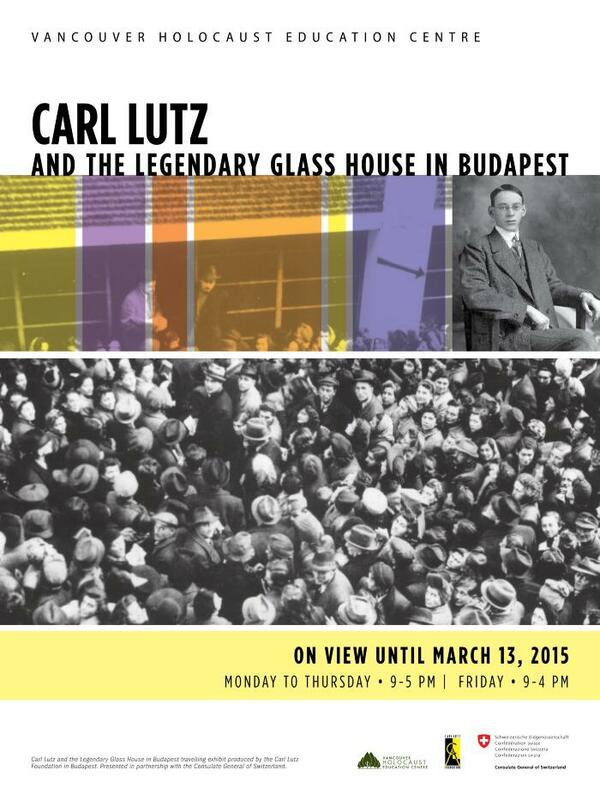 Presented on the 70th anniversary of the Nazi invasion of Hungary, the Vancouver Holocaust Education Centre’s teaching exhibition Carl Lutz and the Legendary Glass House in Budapest illustrates a little-known story of diplomatic rescue and moral courage during the Holocaust in Hungary. The travelling exhibition, on loan from the Carl Lutz Foundation in Budapest, is enlivened by a VHEC-produced companion exhibit, which contextualizes Lutz’s rescue efforts through the testimony and artefacts of local Hungarian Holocaust survivors.